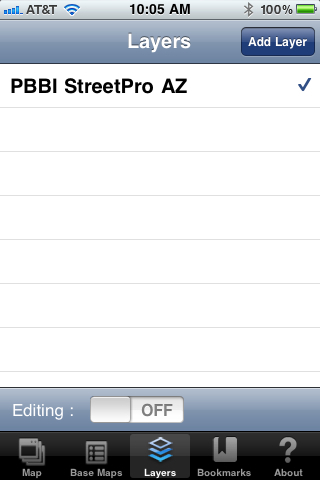 I reviewed ArcGIS for iOS a couple weeks back and liked what I saw. One of my biggest disappointments was the lack of OGC support. 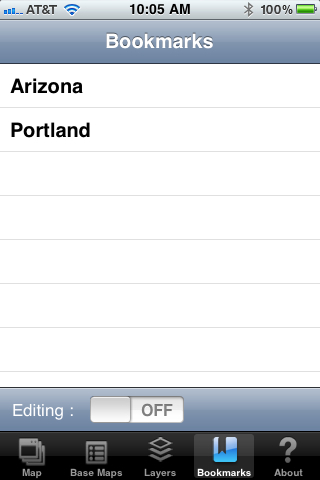 ESRI says it is coming, but in the meantime I took it upon myself to try out other iOS mapping clients. One that has caught my eye is iExtMap. You may recall Alper Dincer?from the 2009 ESRI Dev Summit Challenge where his ExtMap took first place. 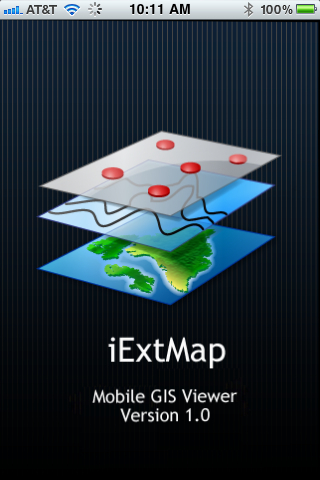 While not built upon ExtMap, Alper has released iExtMap for iOS. So what does iExtMap bring to the table? So let us look at iExtMap in detail. The first screen you see when you start up iExtMap is the Maps window. From here you can navigate whatever maps you have added to iExtMap. 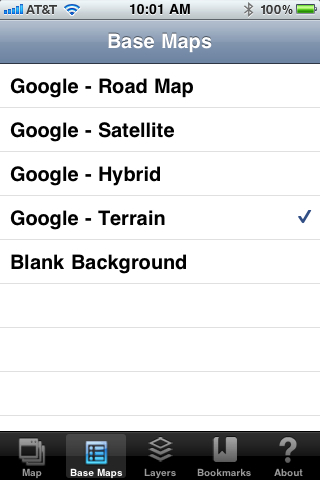 Google is the default background map and in the Base Maps screen you can see how you can choose which “base map” you wish to have in your background. After choosing your background base map, you go to the Layers tab to add layers. The first thing I tried to add was a KML out of WeoGeo Market. 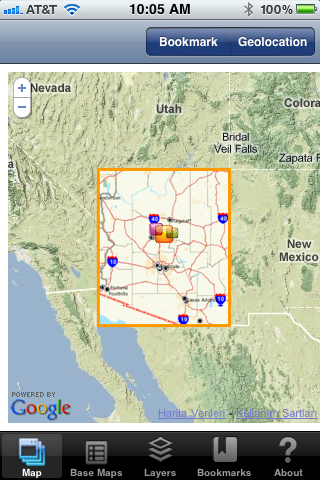 This was easy to add and actually looked pretty good on the iExtMap screen on my iPhone. Just grab the URL to the KML and like that it is added. Adding ArcGIS Server services and WMS is also as easy as copying a URL and pasting. The only issue I ran into was that WMS needs to be in EPSG:900913 making your choice of WMS smaller than it should be. This is a know issue and an update is planned in the future to address it. Adding a KML to iExtMap is very simple. After adding the layer, put a check next to each one you want to view on your iExtMap Map. And here is that KML - viewed on the iExtMap Map. The bookmarks are very strait-forward. 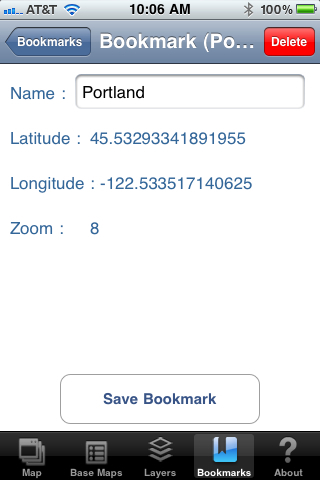 You either bookmark a view on the Map or manually input the coordinates. 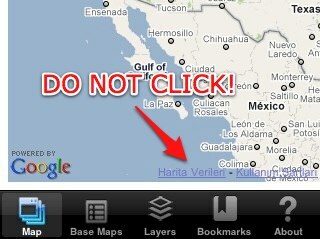 One actually fatal issue of iExtMap is that you can get caught in an info box and have no way to break back out. Make sure when you are on the Map tab, not to click on the links at the bottom of the view (I’m assuming these are the credit links). 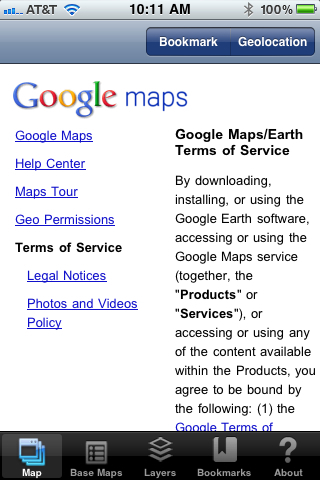 If you do you get stuck on the “about Google Maps” page with no way to get back to the map unless you exit the app. Hopefully this flaw will be fixed very quickly. Don’t get me wrong, the about page is very nice. You are just stuck on it if you get here - yikes! 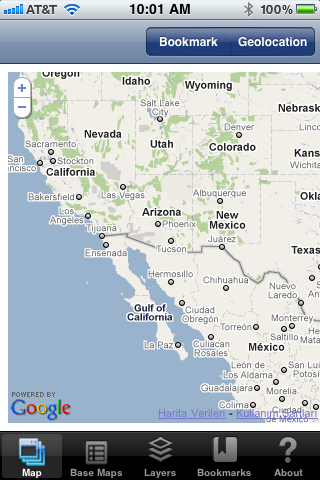 Overall though, I think there is a ton to like about iExtMap. Out of the box you have OGC support (KML and WMS) which I really think is critically important. 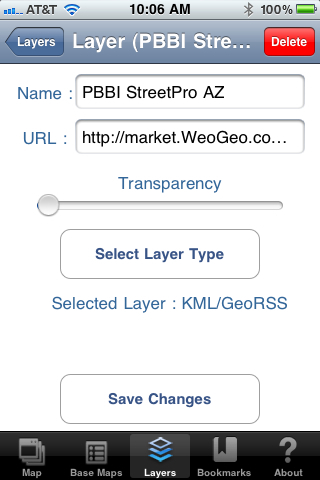 Support for ArcGIS.com (ArcGIS Online) layers is there as well so you have an iOS app that can work across OGC and proprietary services. Alper should be commended on his efforts and I can see myself using this quite a bit to work with OGC services.